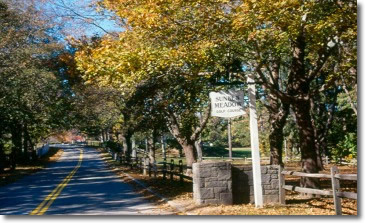 Sunken Meadow State Park, located on Long Island Sound, has a wide range of topography that sustains a variety of flora and fauna. The three miles of beach meets tall, glacier-formed bluffs at the west end of the shoreline. A man-made dam separates the park's brackish creek and marshes from the tidal flats. South of the flats are acres of undeveloped and heavily-wooded rolling hills. Activities include swimming in Long Island Sound; hiking six miles of trails, including the northern starting point of the Suffolk County Greenbelt Trail; biking, horseback riding, picnicking, kayaking, canoeing, windsurfing, fishing, a ¾ mile boardwalk and cross-country skiing. In addition, the park has 27 holes of golf, a driving range and putting green.